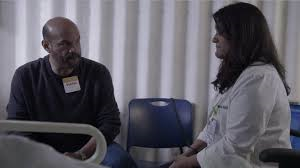 “Extremis” is Latin for “at the point of death.” It is also the name of an unflinching documentary available on Netflix about two families at a hospital struggling to decide whether to take their loved one off the machines that are keeping them alive. The power of the documentary is in its details. There is no narration. There is no music soundtrack. Instead, film viewers hear quiet conversations in hushed tones and the sound of the machines doing their work. It is these moments that tell an intimate story. Hands play a large role. A hand gently applies a cold compress to a patient’s forehead. Another patient tries to use a pen to write a message, but finds she cannot. An unresponsive hand lies still as a doctor urges a patient to squeeze it if she can understand what she is saying. The filmmakers never reveal the location of the hospital. The patients’ last names aren’t used. They are identified by their first names “Donna” and “Selena.” The decisions they face could be ours to make at any time. The anguish on their faces is palpable as they try to figure out what their loved ones want. One family decides to remove the machines. They are helped by the patient who is able to nod to express her wishes. The other family is unable to communicate with their loved one, but believe her beating heart is an indication she hasn’t given up. They decide to keep the machines going. Both decisions are made out of love and the belief that their choice is the right thing to do. Watching a documentary like “Extremis” isn’t easy, but it’s important. It drives home how crucial it is to discuss end of life care wishes with friends and family well before there is a real reason to do so. . Have you made your thoughts about end of life care known to your family and friends? Visit The Conversation Project website for a free downloadable starter kit to help you have this important discussion. If you’ve seen “Extremis,” let us know your thoughts about the documentary by leaving a comment below.